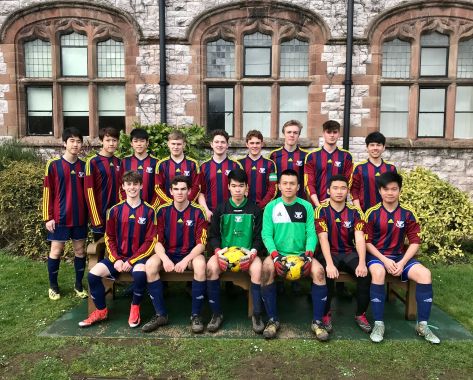 This was the first ever football fixture against Rydal Penrhos School. The game was played in overcast conditions with a pitch that was very wet. The game started brightly, with Ruthin taking control and playing with a high pressure tactic. This proved fruitful and soon the team took the lead through an excellent passing move. Ruthin were playing some of their best football of the season and went into a commanding 4-0 lead by half time. The second half was closer, with Rydal scoring a penalty early on and then putting constant pressure on the Ruthin goal. In the last 10 minutes tiredness came into play and Ruthin scored another two goals. The eventual score of 6-1 was a fair reflection of the match. The game was played in a good spirit and hopefully more matches between the two teams can now be played.